They say that every cloud has a silver lining. "Cloudy" might be a kinder and gentler manner in which to describe the current atmosphere for precious metals in general, and gold in particular. Nevertheless, long-term speculators in bullion and mining stocks may be looking at the kind of opportunity right now that presents itself every several years in the heartbeat of the gold cycle. And please take note that when we say "long-term" we do indeed mean a period of at least 2-3 years. We realize that in this day and age of instantaneous everything, a week can be a long term for many folks. But we've been around just long enough to know that very often more significant periods of time obtain in human affairs. The last time we made a major pronouncement about a "long-term" buying opportunity in an industry was in March 1994. We made our astrological assessment of the energy industry available to a number of capital sources with our "Sidereal Energy Holdings" Fund project. Perhaps the heavy emphasis on the approaching Uranus square to NYSE Neptune (A Classic Oil & Gas aspect if ever there was one) put some people off. People get real funny about the decisions they make with their money. We saw that Uranus square as a crisis point in the energy industry, and since prices had tanked to ugly lows by 1994, we were betting that the turn meant going from down to up in energy prices, rather than a continued slide. Besides, it was a chart reader's no brainer. Share prices of independent producers and drillers were bumping along their lows after plunging to stark depths over the prior couple of years. Drillers were dry-docking rigs, with the lowest active rig count in decades. Crude was at $14 a barrel and everyone said it was going lower, and natural gas was a buck and change and in the pits as well. It was simply too obvious. We all know Oil and Gas aren't going away anytime soon. So it was easy to see a screaming bargain when it quivered in the gutter, waiting to be rescued. Our strategy at that time was to accumulate the shares of independent producers and drillers in a portfolio that we assured investors would surely appreciate 100% to 300% in just 2 to 3 years. We had to be a bit conservative, because when you're asking for great chunks of money from institutions, wonderful promises that warm the hearts of us ordinary folk will often scare away the big boys. Go figure. What we really wanted to say was 200% to 300% but modesty forbade us. Well, in our "long-term," one of the portfolio mainstays of our strategy, Rowan Drilling (RDC), went from our accumulation price range of $6 - $7.50 to $44 a share. Sure beat the Dow! As for the others on our list, many with nice corporate astrologicals to boot, 200% gains marked the laggards. Our point is that in the past year, Wall Street has been feverishly doing energy deals at many times the shares prices we were jumping up and down over when we pitched our project. We also hearken back to just a few "long-term" years ago when General Motors and IBM were crumbling dinosaurs that represented the decline of American industrial might. These two stumblebums made headlines and fairly amounted to some kind of national disgrace. Clearly the time to buy them for the long-term, in retrospect, was it not? We kind of feel the same way right now about gold and silver. In the Summer of 1996 we started shouting about the approaching Uranus square to NYSE Venus (5.27 Taurus), our cherished proprietary gold degree significator (for those who are astrologically challenged, a "significator" in astrology is a planet, or body, or position, that stands in for, represents, or symbolizes, a particular element, phenomenon, or activity. Why and how this works is not relevant to our point this time around, so we'll save that explanation for some future time. Nevertheless, the correlation between major astrological aspects to the Zodiacal degree of NYSE Venus, and significant turns in the gold market, are beyond coincidental. Gold price history and astronomical science verify this statement incontrovertibly). In 1996, the approaching 90 degree angle from Uranus to NYSE Venus, a traditionally "stressful" astrological aspect, threatened to put gold down into a significant decline throughout 1997. This was to be a year during which time Uranus retrograded and came back for a final pass in the Fall of the year. We saw a major bottom in the Spring, and then a final bottom in the late Fall/Early Winter of 1997. Uranus did not disappoint. We are not of the school that perpetually holding and buying gold is some sort of investment panacea. After the 1993 gold and silver rally, we found the action in the metals tedious, and too many astrological opportunities to attack in the stock market. We abandoned the metals for tech stocks and more mundane fare. But we kept a weather eye on 5.27 degrees Taurus. When we observed the Jupiter induced rallies in silver and gold of late 1995 fizzle in early 1996, we knew Uranus was on the way and would indeed be a downer. And it has been. Going down into the pit is not so much fun as coming up out. It's normal human psychology. Nevertheless, we recommended waiting for the Spring 1997 lows, and starting to dollar cost average bullion then. We were writing on the 'net at that time for many astrologically oriented people. For many devout astrologers, money is not a prime life issue, so we felt that a time period of 18 months dollar cost averaging bullion would allow even the most modest of budgets to participate in the juicy pickings of the ugly year ahead. Actually, for average income earner and fat cat alike, this bedrock strategy may turn out to be the wisest direction in which to have proceeded. On Tuesday, the 25th of November, 1997, Uranus opened the day at Exactly 5.27 Aquarius, in a perfect dead on square, 90 degree angle, to NYSE Venus. That was the day, mathematically speaking, of maximum astrological pressure on gold in this bear market. That does not mean that the next day prices are supposed to rebound and embark upon some uninterrupted climb. What it does mean is that the intense negative pressure leading up to that moment will remain for a while as it unwinds, or slowly relents. It can flow forward for weeks, sometimes months, before the exhaustion of the influence allows a significant reversal in price direction. If it were relatively fast moving Mars, or even Jupiter, we were observing, perhaps we could pin down our turning points to days or weeks. Uranus is far too slow moving a planet to be so specific. But in a great sense, most of the ASTROLOGICAL worst is over. The bear is in its terminal stage. In a technical, and fundamental sense, the worst is being experienced now. Like GM and IBM of a few short years ago, gold is being relegated by investors to the financial scrap heap of history. Even many goldbugs are disheartened and throwing in the towel. Never in recent memory have there been so many rumors, tales, and speculations concerning the dismal demise of gold and the snares that have befallen the king of metals. Meanwhile, gold's consort, silver, has already broken out of the downtrend traced by the 1983 and 1987 spike tops that contained it for 17 years. A very bullish portent. After a modest, but picture perfect blast through the overhanging resistance line, silver has dutifully come back in a classic return move to test the breakout. It has firmed outside the former barrier, like an escaped convict, breathing heavily while leaning against the barbed wire fence it has just scaled. The dogs snarl at it from the other side, but the horizon is empty and open for silver now, and fresh winds are blowing toward the distant hills where it must now wend its way to a new life in freedom. Meanwhile, the draconian characters in our international drama hold the very king himself at ransom in a dungeon far below ground. Returned to the bowels of the earth from whence he came, the true sovereign is manacled in disgrace. Daily, it seems, his tormentors visit briefly to pass a half spoiled bowl of gruel under the bars of his cell, or to openly grin at him, and spit in his face. But in all such adventures, this medieval drama must needs have a turn approaching that none would suspect. Silver, now free to gather its strength in the light of day, is already plotting to lead the way for its king. The trusty follower and lesser light may have to be the hero in this modern day fairy tale of menaced metals and paper barons. It may be up to silver to spring the king. In the very heart of mid December, Jupiter makes a comforting sextile of 60 degrees to NYSE Moon at 19 Aries. We see this as a positive. Not necessarily spectacular, but perhaps something to send silver on its merry way upward once more. The Moon, as all astrologers know, even those who do not trade metals, is the classic significator of silver. We watched Saturn approach it earlier in the year and hoped, in error, of a significant rally at that juncture in Summer. Instead, Saturn delivered the final crushing blow to silver in this cycle and drove it to its knees. As Saturn retrograded, silver has benefited from the respite. Saturn will return to conjunction in mid March of 1998. Perhaps the circumstances this time around will be more fortuitous than the last. Or perhaps this will mark a reaction or pullback after higher prices. In any event, the return of Saturn in March will once again bring a significant event in the silver market. It is the nature of long-term bottoms, and all such turning points, that they generally last for a significant measure of time. The descent into hell, and the initial stages of clawing one's way out, may take months. As gold approaches its 1985 lows of 285, it would seem to all that the king of metals is now, more than ever, merely some "barbaric relic." Those who have championed its nobility have been, in some measure, disgraced along with the metal itself. But the sublime philosophy of value for value, inherent in the medium of exchange, which makes men accountable to one another, lives on. And the laws of value shall not, to use the word of one singularly astute observer of men and markets, be "conned." For those who say that the paper economy has allowed the fantastic material progress of our age, we say that this progress would have been greater, more efficient, far less wasteful, and a good deal more moral and accountable, had gold been the medium of exchange behind every paper note. For those who say that there is nothing wrong with fiat money, because "it works for us," we say it appears to be the same for your fiat philosophy (or lack thereof), fiat economy, and fiat society. We are in a world with no values, save numbers, and for what end? In the end, even our numbers will have no value. The markets are strewn with the corpses of goldbugs, squashed underfoot by the paper juggernaut. In no investment arena, or niche, is there such gloom as in the realm of king gold. Like energy in '94, those we approach to initiate strategic and far sighted gold projects now look askance at us. Their expressions give away the desire within to roll their eyes openly, and whirl their forefingers derisively beside their temples. They do not see that in the crisis is opportunity. All the more reason to believe that in the deepest part of night, the wise soldier comes awake, and prepares for the day ahead. The compelling events of the day could come more swiftly than expected, and could come even before the first rays of dawn awaken the laziest troops. But they will come. Yes, for the moment the king is dead. But the bear is dying as well. Long live the king. Our annual "Obsidian Wave" phenomenon is underway. Every Fall Pluto goes direct, or forward, after a Spring and Summer of retrograde (apparent, but of course not actual, backward motion). We look for corporations whose natal incorporation horoscopes show significant planets or features (Sun, Moon, Ascendant, etc) in Pluto's path. Often these shares undergo dramatic activity between the initial contact around this time of year and the exhaustion of Pluto's conjunction by mid March. We would be remiss if we did not point out that 2 of our picks for this cycle are precious metals companies. One is GSTD, which we spotlighted some months back, the other is the Lexington Strategic Silver Fund. One more portent that the precious metals bear may be about to enter hibernation? The other, non mining shares we're observing for this year's "Obsidian Wave" are: TODDA, RMCF, LCSI, EROX, DMIF, DECO, BICO, MAIL, SPZN, BEAM. If pressed to the wall and asked to pick three out of the whole bunch, on an astrological and intuitive basis, at current prices, we would go with EROX, GSTD, and IDCC. In any event, do your due diligence. Some of these companies are very interesting, while others may be financial basket cases. Nevertheless, when Pluto sweeps over their Sun, or Neptune, or Mars, all hell is usually ready to break loose. From time to time we receive requests for information about our "newsletter," or other services. 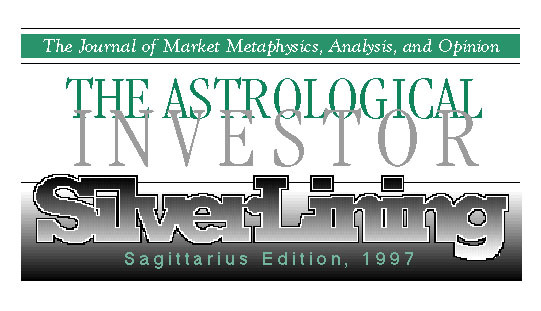 We are happy to explain that with The Astrological Investor, what you see is what you get. Whatever we have to say is given free here as our own opinion and view of things. We have no other "newsletter" and do not take money or fees of any kind from the general public for The Astrological Investor. It may be pointed out, however, that for those institutional investors, or qualified individuals, of an astrological or metaphysically technical orientation, we are available to assist in, or propose, business projects to take advantage of apparent market anomalies and astrological opportunities. We always enjoy making contact with those with similar interests and objectives.